A decade ago, Warren Buffett made a famous bet with hedge fund manager Ted Seides. Buffett believed that hedge funds cannot beat the S&P 500 due to their high fees. Both parties put enough money in treasury bonds at the end of 2007, which was supposed to be worth $1 million by the end of 2017. Buffett’s pick of S&P 500 did better than the portfolio of hedge funds selected by Ted Seides. This bet has been widely publicized by many investors. Those who believe in indexing use it as a reason to reinforce their beliefs. After all, the S&P 500 did much better than the hedge funds. Unfortunately, the reason why the hedge fund bet did worse than S&P 500 over the past decade comes down to the fact that it had high costs and because it was globally diversified. It makes sense that a hedge fund that charges high fees has a high hurdle rate relatively to a low cost portfolio of stocks. For example, hedge funds charge investors a 2% annual fee. In addition, they also charge investors a performance fee based on assets under management. The fee is for roughly for 20% of gains on investment. This is a rather steep set of fees, given the fact that the investors are the ones coming up with the capital at risk in the first place. The other fact is that those hedge funds focused on US Equities, Foreign Equities and other asset classes. This is why the comparison to S&P 500 is not really an apples to apples comparison. However, even if we compare the performance to an equally weighted portfolio of US stocks, Foreign Stocks and Bonds, the hedge funds did not deliver either due to fees. However, the margin of error was lower. I believe that the reason why the bet didn’t do as well was due to high fees, and the fact that we are not comparing apples to apples. As a DIY investor, I do not understand the need to have someone else look after your money. Wall Street makes its money by making investing complicated, so that they can charge you fees forever. The truth is, building your own portfolio isn't really that difficult. I will illustrate this concept with this article. 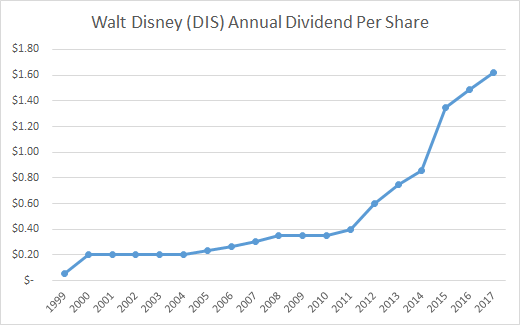 A dividend king is a company, which has managed to grow annual dividends for at least 50 years in a row. There are only 26 such companies in the US, and perhaps a couple more in the rest of the world. It is not a small achievement to have been able to reward long-term shareholders with a dividend raise for over half a century. As part of my monitoring process, I review the list of dividend increases every week. I try to narrow down this list to a more manageable level, by focusing only on companies which have managed to boost their distributions for at least a decade (with one exception listed below). I also tried to provide a brief summary on each company, citing reasons why I like or dislike at the moment. Regular readers will not be surprised that just because a company has managed to raise dividends for a decade, that doesn’t mean that it is an automatic buy. I try to review the trends in earnings, as well as valuations and dividend sustainability, in order to come up with a quick decision whether a company is worth investigating further for a potential addition to the portfolio. In general, I am looking for a company that grows earnings, grows dividends, has an adequate margin of safety in dividends, and has an attractive valuation. AT&T Inc. (T), which provides telecommunications and digital entertainment services. The company operates through four segments: Business Solutions, Entertainment Group, Consumer Mobility, and International. The company raised its quarterly dividend by 2% to 50 cents/share. This marked the 34th consecutive annual dividend increase for this dividend champion. The company has tended to boost its quarterly dividend rate by a penny over the past five years. This is due to the high dividend payout ratio, and the very slow growth in earnings per share. Due to the high yield however, shareholders are happy with any raise they can get. The company managed to boost earnings per share from $1.94 in 2007 to $2.10 in 2016. The company is expected to earn $2.92/share in 2017. AT&T is a popular holding for many retirees looking for current income with its 5.20% dividend yield, which is adequately supported by its 69% forward dividend payout ratio. The intense level of competition is the only thing that has stopped me from owning AT&T. The stock is cheap at 13 times forward earnings and that yield of 5.20%. If the company manages to keep the dividend, it can generate very good returns to shareholders over the next decade. Unfortunately, when companies take on too many acquisitions with debt, they have prioritized debt repayment over dividend growth. Let’s hope that this is not the case for AT&T. 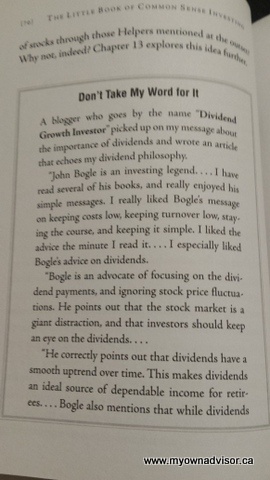 I recently learned that John Bogle had mentioned my humble blog in his latest book "The Little Book of Common Sense Investing" from a book review by my friend Mark Seed. The book is worth a read by investors from all levels of experience. I am beyond honored that John Bogle, who is a giant in the field of investing is even aware of my site. Actually, saying I am honored is an understatement. As part of our monitoring process, we review the list of dividend increases every week. In this monitoring process I review the rate of dividend increases for companies I own. This is one of the many ways to evaluate if my thesis is still working. I also use this tool as one of the ways to review companies I may be interested in buying at some point in time ( provided the price was good). I also post these updates on this site to share with you how I quickly evaluate companies and either put them on the list for further research or immediately discard them for the time being. Since our time is limited, we want to focus it on the best opportunities, available at the best prices today, and place the rest of opportunities on hold. For this weekly review, I focused on the dividend companies whose boards approved a dividend increase over the past week. All of these companies have managed to reward shareholders with an annual raise for at least a decade.